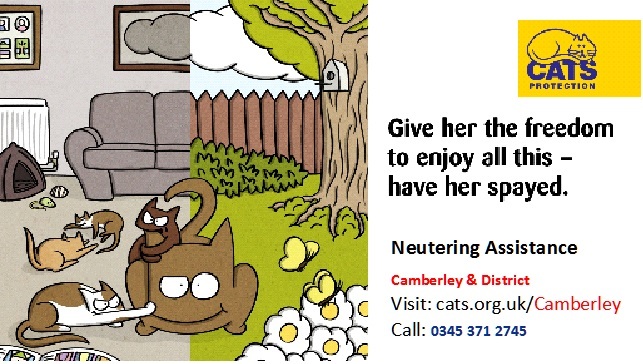 This Cats Protection branch is run by cat-mad volunteers, who are dedicated to improving the lives of cats and kittens in Camberley & surroundings areas. Our webpages are updated regularly to make sure we provide up to date information on our cats, and local fundraising activities. Are you able to offer a cat a home? We have some lovely cats in our care. Take a look at the adoption page. Our fluffy friends would love to move from foster care, and find a forever home with you. We are currently looking for volunteers to helps us with fundraising and transporting cats. For feline fun and to stay up to date with our news and events why not follow us on Facebook, Twitter or follow our new Instagram page.